Most people know about San Francisco’s architecture, steep hills, beautiful bridges and cable cars, but few know of a group of Mormon pioneers that arrived by ship in 1846 and helped build the city by the Bay. This religious community known as the “Brooklyn Saints” was the first group of immigrants to arrive in California by sea after it became U.S. Territory. Surprisingly, San Francisco, not Salt Lake City, was the first city built by Mormon pioneers in the West. The Mormon History Walking Tour includes main points of interest involving the early history of the Church of Jesus Christ of Latter-day Saints in San Francisco. Other California historical sites are also marked on the tour. The tour booklet begins with a brief history of the Brooklyn Saints and Samuel Brannan. The actual walking tour begins on page twelve. The walking tour route encompasses an eight square block area on mostly level ground. The tour begins and ends in Portsmouth Square because of the availability of parking in the garage under the square. You may begin the tour at any point on the map. One can walk the entire tour in 30 minutes. For real history buffs, other Mormon history sites not on the walking tour are listed at the end. Most of the other sites are only a few minutes drive from the tour route. Most tour stops are clearly noted with an informative plaque. However, because San Francisco has experienced such a drastic change in architecture from the year 1846 to the present, some tour spots will require you to imagine how the Brooklyn Saints lived, the nature of the buildings in 1846 and the primitive state of the city at that time. The Financial District and Chinatown are the primary areas one will be touring. Take your time and enjoy one of the most beautiful cities in the world while learning some history at the same time. Some two hundred and fifty members of the Church of Jesus Christ of Latter-day Saints boarded the ship Brooklyn in New York harbor on February 4, 1846, and began a 24,000 mile voyage to San Francisco. Under Brigham Young, the Nauvoo, Illinois exodus had begun in January, 1846, to escape the armed mobs and continued persecution for a new home on the western frontier. That winter approximately 20,000 Mormons were scattered on the prairies from the Mississippi River to Council Bluffs, Iowa. Meanwhile, in New York, many of the Brooklyn Saints were too poor to put wagons and teams together for a cross-country trek, so they were advised to book passage around South America and meet the group in the west. The Brooklyn company was led by Elder Sam Brannan, a 26-year old New York printer. The ship’s manifest when it left Hawaii (reprinted in the Friend, an article in the Times & Seasons, and reconstructed by recollections of some of the passengers) listed the Mormons as 70 men, 68 women, 100 children and two or three unaffiliated businessmen. Captain Abel W. Richardson, an experienced ship’s master led a crew of twelve. Passengers were primarily farmers and merchants from eastern states. The Saints brought everything they would need to begin a new life in the West. They took farming equipment, flour mills, sewing machines and even a printing press along with type, paper and ink. The leaders of the Church believed they would never be allowed to practice their religion freely in the United States of America; therefore, Brigham Young asked Brannan to lead the Saints to this uncharted territory, which was then part of Mexico. The Brooklyn was chartered to carry freight to the Sandwich Islands (Hawaii) to help defray the costs of passage for the Saints. The Brooklyn’s voyage lasted almost six months. Twelve Saints died, many of scarlet fever, en route around Cape Horn. The first LDS sermon preached in South America was a funeral service for one of the departed Saints, Laura Goodwin, at Juan Fernandez Island. The passage was difficult for those on board. The passengers were confined to an area the size of a 2,500 square foot home that rolled and pitched. The space had been remodeled between decks into 32 small staterooms with bunks. A long dining area with benches was in the middle of the ship. The ceiling was so low that some of the men were too tall to stand up straight in this space. One baby born on the Atlantic was so named as was a baby born on the Pacific. On June 20, 1846, the Saints reached Diamond Head (Honolulu), 136 days after embarking in New York. The Saints received a warm welcome and were delighted to spend some time ashore before continuing their voyage. They heard of war with Mexico in California and the men began drilling as soldiers. About three weeks later on July 9, 1846, Captain John B. Montgomery, commander of the USS Portsmouth and others participating in the Bear Flag Revolt, formally took possession of Yerba Buena (soon to be renamed San Francisco) and ran the stars and stripes up the flag pole at the main plaza now known as Portsmouth Square. Along with John Fremont and Kit Carson, William Ide, a delegate to the convention that nominated Joseph Smith for President, led the Bear Flag Revolt. The Brooklyn sailed into the Bay on July 31, 1846, under gray, foggy skies and on choppy seas. The ship anchored in Yerba Buena Cove, approximately where the Ferry Building now stands. After the Fort and the Brooklyn exchanged salutes, a sturdy row boat full of uniformed men arrived and trod the deck. A Brooklyn passenger, Augusta Joyce Crocheron, described the boarding, “In our sweet native tongue the officer in command with head covered, courteously and confidently said in a loud tone, ‘Ladies and gentlemen, I have the honor to inform you that you are in the United States Of America!’ Three hearty cheers were given in reply from hearts strong, brave, hopeful and loyal still.” Small boats helped disembark the Brooklyn passengers at Rocky Point, now the comer of Broadway and Battery. The Mormons more than doubled the population of Yerba Buena and thus, San Francisco became largely a Mormon town. In the days following the landing, some Saints occupied the customs house, vacant adobe huts or military barracks while some rented houses or lived in wind-whipped tents. The first non-Catholic religious service in town was conducted by Brannan in the Casa Grande on Portsmouth Square. This was the largest structure in the village. Some services were performed in Brannan’s home after many of the Saints scattered to different areas of California. The industrious Saints transformed the primitive square into a prosperous town, building California’s first public school. Brannan published The California Star, the first newspaper in San Francisco, using the printing press he transported on the ship. Other Mormons became craftsmen, tailors, bakers, surveyors, gunsmiths, masons, carpenters, cobblers and even attorneys. Sam Brannan was a driven and dynamic entrepreneur who was responsible for both good and mischief. A printer by trade, Brannan not only brought the Saints to California but also brought the written word by publishing the first newspaper in San Francisco. A natural leader, Brannan was instrumental in organizing the Saints in their new territory. He was a man of many “firsts” C California’s first millionaire, San Francisco’s first publisher, first banker, first defendant in San Francisco’s first lawsuit, officiator of the first non-Catholic wedding ceremony and he delivered California’s first English language and non-Catholic sermon. He is also credited as the first to announce the discovery of gold, an announcement that changed San Francisco and California forever. The Gold Rush of 1849 was started when Brannan paraded through San Francisco streets holding a quinine bottle of gold over his head shouting, “Gold, gold, gold on the American River!” He announced the discovery of gold to the world on April 1, 1848, by special edition of the Star that was sent by riders and ship to New York. The New York Herald quoted the article with an emphasis that started the ’49er migration. Brannan’s hardware store at Sutter’s Mill prospered with the increased sales and soon he opened another store for miners’ supplies at Coloma. Having essentially cornered the market, he soon became California’s first millionaire. Before the Gold Rush, Brannan was convinced that California was the promised land and traveled east to persuade Brigham Young to bring the Nauvoo Saints to San Francisco. He met Brigham Young in Wyoming on the banks of the Green River near the mouth of Big Sandy and tried to persuade the prophet to travel to California, “a paradise.” Young’s own vision of the promised land was not altered and Brannan reluctantly returned to California. After learning of the Saints final arrival in the Salt Lake Valley, Brannan saw himself as the leader of the church in San Francisco. But some of the Brooklyn Saints disagreed with his methods. His family traveled to Europe where his children were educated in Switzerland. Brannan eventually left the Church and was excommunicated. He invested his fortune in the development of Calistoga’s hot mud baths and spas, a Napa Valley railroad, the city of Sacramento and in Mexico. Many of his later enterprises failed. His downfall was as abrupt as his ascension and thus he died alone in poverty in Escondido, California. In 1848 most of the Brooklyn Saints left San Francisco for the gold mines, however, the Mormon colony only dwindled temporarily during the Gold Rush. 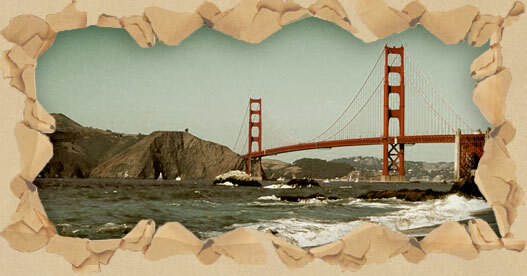 In 1851, the gold miners returned to San Francisco and were joined by other Mormons from Utah, the Pacific and Europe. Some then left to join Mormon communities in southern California and Arizona. In 1857, Brigham Young called all Mormons to Utah to help defend Zion against Johnston’s Army. Although the Mormon community was diminished in San Francisco, the legacy left in a span of a few years included over 100 buildings in the city, farms all over Northern California and flourishing businesses in San Francisco. The tour begins at the flag pole on Portsmouth Square. This square was essentially the birthplace of San Francisco. On this spot the American flag was first raised on July 9, 1846, by Montgomery and his marines of the USS Portsmouth signaling the end of Mexican rule. At this time the ship Brooklyn was en route to San Francisco from the Sandwich Islands (Hawaii). Portsmouth Square was established in 1835 by William Richardson, an English sea captain. In the 1800s this plaza was the center of town. Many important events took place in this square including Sam Brannan’s dramatic announcement on May 11, 1848, of the discovery of gold. The U.S. Customs House and the town jail were also located on the plaza near the entrance to the parking garage. Now it is a favorite resting spot, playground and card playing area for the Chinese community. This famous writer of sea tales spent days sitting in this square conversing with townsfolk and watching ships sail in and out of the harbor. The bronze sculpture atop the granite pillar is the galleon Hispaniola, a ship in Treasure Island. Stevenson’s most famous novel. Leaving the plaza, walk up Washington toward Grant and find 743 Washington. This ornate building topped with a three-tiered pagoda is the United Commercial Bank . Look for a small plaque in the ground just outside the door of the bank. Many historians note this spot as the place of Brannan’s first home that he rented after arriving on the Brooklyn. Some church services may have been held here. He later built a home one block up the hill on Stockton. More importantly, this is also the location of the first newspaper in San Francisco, The California Star. Brannan began regular publication on January 9, 1847. The Star gained national notoriety for its April 1, 1848 account of the discovery of gold in California. Brannan sent this issue back East by express riders and by ship around Cape Horn. He and his partners in commerce were interested in attracting settlers to California. Brannan’s May 11,1848 announcement of the discovery of gold while walking down Montgomery Street started the Rush in San Francisco. The first news accounts in the East arrived in August. The article on gold in California was widely circulated and reprinted and President James Polk quoted it in his State of the Union message. This Chinese bank, built in 1909, was formerly the Chinese exchange of the telephone company. People did not bother with telephone directories in the early 1900’s. The caller would simply call and ask the operator for John Lee. “Big John or Limpingjohn” would respond the operator in Chinese. Then the caller could be connected immediately with the person. The operators reportedly memorized over 1 ,000 names. Continue to walk up Washington and turn left on Grant. Notice two large buildings on the right in the middle of the block. This was the site of Casa Grande, the largest structure in Yerba Buena when the Saints arrived in 1846. The structure’s private owner allowed nine Brooklyn families to set up temporary residence here. This was also the site of the first Mormon church service in San Francisco. Proceed down Grant toward Clay and enjoy the sights and smells of Chinatown. Originally, this street was named DuPont Street and was the site of many Latter-day Saint dwellings. When the gold rush hit in 1848, many Mormons abandoned their new homes and went to pan gold. Enterprising Chinese merchants, already occupying much of this street, obtained squatters rights on the abandoned Mormon homes, thus making this and the adjoining streets, on which the Saints had erected more than a hundred structures, part of Chinatown. Turn left down Clay to Portsmouth Square and a monument to California’s first public school house. After many citizens and the press called for educational projects, a public school house on the plaza was completed in December of 1847. The school officially opened April 3, 1848. Before the public school was built, a private school in a small shanty on the block between Broadway and Pacific on Dupont Street was open under the direction of J.D. Marston. This school was closed after about 40 pupils transferred to the new school. There have also been reports of a small informal school in the Mission Dolores started by some Brooklyn families in 1846. The gold discovery closed the public school until April 1849 when it was re-opened under the management of Reverend A. Williams, aPresbyterian minister. On Clay Street turn left and walk down toward Kearny Street. You will soon see the lower level of the plaza on your left. Walk inside and locate the Andrew Hallidie plaque set in stone. This was the site of the first street car in the world propelled by cable. The cable cars operated on Clay Street from 1873 to 1942. Continue down Clay toward the intersection of Clay and Kearny and locate an old building on the southwest corner. This is the probable location of the first hotel in San Francisco, Brown’s Hotel, operated and owned by John H. Brown in 1846. Now look across the street and notice the Portsmouth Hotel down the block on the southeast corner. On the side of the brick building in faded paint rooms are advertised for 25-30-35-50 cents. Brooklyn women found employment in this new hotel owned and operated by Brown. It was also here that the Brooklyn Saints had their only reported skirmish. The officer in charge of the marines who guarded the town secretly visited Brown each night to have his flask filled with whiskey. He would go to John Brown’s window, rap twice on the shutter, and then say in a barely audible voice, “The Spaniards are in the brush”C a signal that he needed whiskey. One night. Brown was sleeping soundly and did not hear the knocking at his window. In frustration, the officer, who had already been drinking, fired off one of his pistols, and sang out at the top of his voice, “The Spaniards are in the brush.” Immediately an alarm “was sounded in the barracks, and quickly the Saints were up and on hand with arms and ammunition, ready to furnish what service they could. They remained on guard for three hours. There were several shots fired by those on duty, thinking they were shooting at Spaniards; but they found the next day, to their great surprise, that instead of dead bodies, some scrub oak had received shots. Cross the street and continue down Clay on the left side of the street. Notice the five plaques on the side (Clay Street) and front of the California National Bank Building (601 Montgomery). These illustrated plaques detail the history of the famous Pony Express. The first express service from San Francisco east was Brannan’s. In 1848, he organized one to carry copies of his newspaper east, using Mormon battalion men as riders. He sent 2,000 copies of his newspaper from San Francisco on April 3, 1848. His article on the gold discovery “was reprinted in Missouri in July, and in New York City in August, more than three months after they left San Francisco. Overland mail stage later reduced the time to 23 days and the Pony Express to as little as seven days. Many of the riders were Mormon. Mail delivered via Pony Express from the East took 10 to 13 days. One hundred twenty riders using 190 stations made a record time of the nearly 2000 miles on March 4, 1861, bringing Lincoln’s inaugural address in only 7 days and 17 hours. The last stage, Sacramento to San Francisco, was by steamboat. The Pony Express operated for only 19 months before being replaced by the telegraph that revolutionized communications. The Pony Express was in operation from April 3, 1860 to October 26, 1861. Continue down Clay on the north side of the street crossing Montgomery. Locate a plaque on the side of Two Transamerica Center on the corner of Sansome and Clay. In 1849, hundreds of abandoned sailing ships littered Yerba Buena Cove. Crew members jumped ship to chase gold. Therefore, old abandoned ships were used as hotels, saloons, storehouses and lodgings. The remains of the ship Niantic was uncovered while excavating for a building behind the Transamerica Tower. A fire in 1851 destroyed all but the submerged hulk that later was utilized as the foundation for the Niantic Hotel, a famous hostelry that stood until 1872. Turn around and walk toward Montgomery, crossing Clay Street. Find the Montgomery plaque at 550 Montgomery on the southeast corner. On this site, the U.S. Sloop-of-war “Portsmouth” landed on July 9, 1846, under the direction of Montgomery. In 1846, this street was the high-tide beach of Yerba Buena Cove. Years later the water east of Montgomery was filled with landfill which created some much-needed flat land in the city. Cross Montgomery and walk south until you reach Commercial Street in the middle of the block. On the southeast comer was the “A Merry Hall” owned by Brannan. This comer was later deeded to Brannan’s daughter. Lisa. Near 608 Commercial on a quaint red brick building is a plaque commemorating the first U.S. Branch Mint in California. The mint was authorized by Congress on July 3, 1852, and opened on April 3, 1854. Now the “Old S.F. Mint” is located on the comer of Fifth and Mission Streets. Now face east and look down Commercial Street; you will see the San Francisco Ferry Building between two skyscrapers. At the foot of Commercial Street once stood the “long wharf where ships unloaded goods. This 2,000 foot wharf was one of Brannan’s projects. The wharf projected nearly a half mile out into the Bay due to the shallowness of the cove, making it possible for the largest commercial vessels to unload merchandise for Brannan’s stores and other commercial enterprises. The Long Wharf and Commercial Street were lined with many businesses making it a center of commerce in the 1850’s. Across the street from the former mint on a granite high rise you will find a plaque marking the site of the famous Hudson Bay Company. This shipping company began operations in 1841. Shipping beaver pelts, bear skins, deerskins, cowhides, etc. to the east coast was one of San Francisco’s earliest industries. Because of the decline of the fur catch and pressure of U.S. expansion, the company was forced to close its California operations. At 420 Montgomery, the Wells Fargo Bank History Room stop is a must. The first banking offices in San Francisco were opened on July 13, 1852. The Gold Rush bolstered the bank and soon it controlled the most extensive communication and transportation network in the West. In the history room, you can sit in a stagecoach or view gold nuggets and famous currency. It is open Monday-Friday, 9:00 a.m. to 5:00 p.m. Admission is free. Continue south on Montgomery to the northeast comer of Montgomery and California (400 Montgomery). At this location, Brannan opened his own bank in September of 1857. Over the next few years, the bank prospered. It was the custom of the time for large banks to issue their own currency, which Brannan’s bank did. As the U.S. became embroiled in a civil war, the U.S. currency lost much of its value. Many San Franciscans preferred to hold Brannan’s currency over that of the U.S. Turn the corner and walk east on California to the Bank of California at 400 California. Inside the bank and downstairs is the Museum of Money of the American West. This small museum houses an impressive collection of Mormon money. Five Kirtland Notes in $1, $2, $3 and $5 denominations originally dated 1837 and signed by Joseph Smith and Sidney Rigdon are on display. The notes were reissued in Salt Lake City in January of 1849, and countersigned by Brigham Young, Heber C. Kimball, Bishop N.K. Whitney and Thomas Bullock. The three dollar note is one of five known in existence. Other notes and coins dated Jan. 20, 1849, are also encased for inspection. These gold backed treasury notes of the proposed State of Deseret were the first currency printed west of the Mississippi. Favorite symbols on the coins displayed are three-point Phrygian Crown over the all seeing eye of Jehovah, clasped hands, and the phrase “Holiness to the Lord.” Some gold mined in California was transported to Utah where it was minted into coin. The museum is open Monday to Thursday 9:00 a.m. to 4:00 p.m. and Friday 9:00 a.m. to 6:00 p.m. Admission is free. One block east at 350 California is a plaque explaining the original shoreline. The inside frame and walrus heads carved from Sierra granite are from the Alaska Commercial Building and were completed in 1908. Continuing east on California, turn left on Battery Street and precede six blocks to Broadway, cross the street and turn right until you reach 1OO-120 Broadway. The plaque is located near the door of 120. The plaque was replaced at this site by the Daughters of the Utah Pioneers as part of the 1996 Sesquicentennial Celebration of the Saints arrival in San Francisco. The plaque was once located in the sidewalk, but was moved after the surroundings were damaged in the 1989 earthquake. As you look down Broadway toward the Bay and then to the right down Battery to Market Street you can imagine that all of the land you see between these two vistas was under water at the time the Saints arrived. An optional tour stop, this outdoor plaque dedicated to the Mormon inventor of the television is located on the northwest corner of Sansome and Green. In a simple laboratory at this location, Philo T. Farnsworth, a Mormon pioneer in electronics invented and patented the first operational all-electric television system on September 7, 1927. Return walking south on Battery and turn right on Jackson. Notice the huge granite Customs House on the southwest comer. This majestic building was built in 1906. Continue to walk west on Jackson and cross Sansome. Many buildings on this block were spared in the 1906 earthquakes and fires. The buildings on the south side of the street were built in the 186o’s, some are Victorian in design. Most of these are still standing. The buildings on the north side of the street in the middle of the block were built in the 1850’s and were more simple in design. Today the street is lined with high-priced antique shops and interior design studios. Notice in the middle of the block, an alley known as Hotaling. This small paved street was also spared in the fire. Many whiskey warehouses and saloons were located in this area in the late 18oos and ironically most were spared in the 1906 fire while many churches burned to the ground. On the northeast corner of Jackson and Montgomery, find the plaque commemorating William T. Sherman’s bank. Established in 1853, this bank remained in business until 1857. This is the same Sherman who led the famous “Sherman’s March to Sea” at the close of the Civil War. Buildings on the left were spared in the 1906 fire. Other buildings of historic importance are on this street. Near 735 Montgomery, the building where the first Jewish services were held in San Francisco is gone, but a plaque marks the site. One building, 723 Montgomery, marks the birthplace of Freemasonry in California. At 722 Montgomery, the Belli Building, built in 1851, is a classic example of early San Francisco architecture. The Columbus Savings building on the comer of Montgomery and Washington looks unchanged. Before the ominous Transamerica Pyramid towered over this block, another famous landmark, the Montgomery Block, stood here. Built in 1853 by Henry Halleck, this building was San Francisco’s first fireproof building. The four-story, stone building was spared in the fire and was the largest and most prestigious office building in California. The building housed outstanding lawyers, financiers, writers, actors and artists. The building stood until 1958. The Transamerica Pyramid, San Francisco’s tallest building, was built in 1972. A plaque can be found inside the pyramid lobby along with an art gallery. While this marks the official end of the Mormon History Walk, following is a list of other interesting sites pertaining to LDS history. Many are only a few minutes drive from Portsmouth Square. Located at 26 Seventh St., at Market, this building stands on a lot Brannan donated to the Odd Fellows in perpetuity. The Odd Fellows symbols on the building are reminiscent of LDS temple symbols. Brannan is said to have formed this Odd Fellows lodge after being denied entrance to the LDS temple by Brigham Young in 1847. Just down Market Street at 909 Market is the site of the California LDS Mission headquarters and the meeting place for the San Francisco branch in the 1890’s. On the northeast corner of Taylor and Vallejo is a steep hillside park once the home of California poet laureate and niece of the prophet Joseph Smith, Ina Coolbrith, named Josephina Smith at birth. The park has magnificent views of the Bay and what was once the Latter-day Saint colony at its feet. Look for the commemorative plaque to this daughter of Don Carlos Smith, Joseph’s brother, at the top left-hand corner of the park on Taylor Street (as you face uphill). It was from a terrace overlooking the Bay from this hotel located on the corner of California and Mason, that President (then Apostle) George Albert Smith in 1924 looked across the Bay and saw the future Oakland Temple in a vision nearly 40 years before its completion. It was in this grand home on the southeast corner of Octavia and Sutter (1533 Sutter Street) that President Wilford Woodruff stayed on two separate occasions while negotiating with California Senator Leland Stanford. Woodruff promised Stanford the Church would cease practicing or teaching plural marriage, and in return Stanford, whom Woodruff described as “a good friend” agreed to raise his voice in the Senate in favor of Utah statehood. Woodruff later died in this home in 1898. At 3 3 21 16th Street, is one of the original California missions built by Father Junipero Serra before California became part of the United States. Several Brooklyn families found shelter here, where in 1846 Brooklyn passenger Angelina Lovett taught the first English-speaking school in California. Brooklyn passenger, Ann Frances Moses Valencia, is buried in the small cemetery adjoining the mission. For a small donation, you can tour the Mission, stroll through the garden-like cemetery and find Ann’s gravestone. Ann married into a prominent California family who once owned most of the land between here and the San Francisco airport and much of the area adjacent to the mission known as “Horner’s addition,” developed by Brooklyn passenger, John Horner. Ann died at age 25 after bearing four children. Located at 1090 Point Lobos this San Francisco institution was one of Brannan’s ideas and is a great place to enjoy lunch situated on the side of a steep cliff overlooking the Pacific Ocean. This museum is located at the top of the Napa Valley in Calistoga, a one hour and thirty minute drive north of San Francisco. This museum houses an impressive diorama depicting life in Calistoga in the 1860s. A replica of Sam Brannan’s cottage is also on display. The museum is open daily 10:00 a.m. to 4:00 p.m. April-October and Noon to 4:00 p.m. November-March. The museum is located one block west of Lincoln Avenue on Washington Street.